Good oral health is critical at any age. 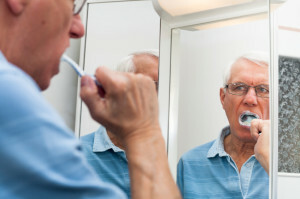 Unfortunately it seems that maintaining good oral health into old age may be a challenge for some, especially if they are unable to keep their teeth and gums clean or their medical status becomes complicated. Challenges to maintaining an effective cleaning routing includes loss of dexterity, mobility, autonomy or awareness. Sometimes medications can cause a person’s mouth to become excessively dry, and in these conditions the lining of the mouth can become very fragile and tender, and bacteria around the teeth and gums may proliferate. When older Australians require others to care for them, it is important that their oral health remains a priority. If teeth are painful because of decay or abscess, or loose because of gum disease, or if dentures are ill-fitting or the mouth is dry as a result of taking medications, it can be very difficult to eat: this in turn can lead to poor nutrition which of course has a significant impact on general health and well-being. Another possible outcome of poor oral health in the elderly is for pneumonia to develop. The authors of this article concluded that ‘poor oral health is a major risk factor for aspiration pneumonia in older adults’. On the eve of Pneumonia Awareness Week (6-12 May, 2014) please make sure that your loved ones know that good oral health can have a significant positive impact on many aspects of an individual’s health throughout their life. If you need any information about providing effective oral health care for an adult who cannot themselves achieve it due to their medical condition or reduced physical or mental capacity, please call us for advice and assistance.